WINTER DRESSAGE FESTIVAL held by Dressage NSW at Clarendon. 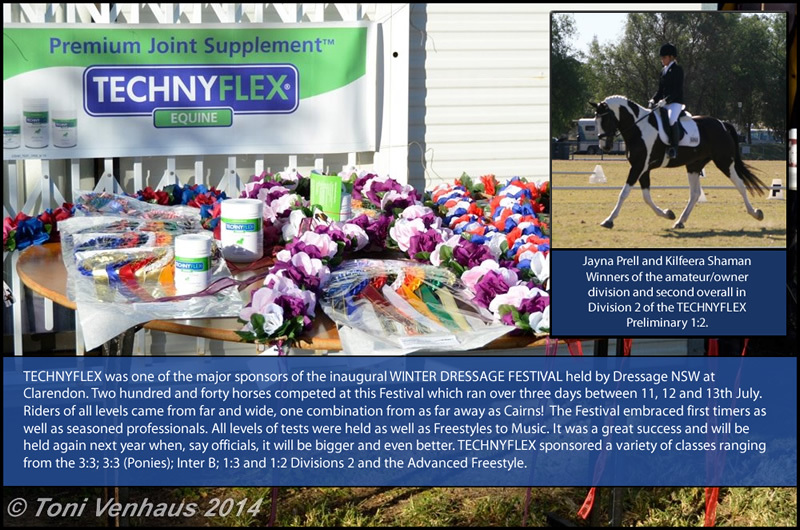 TECHNYFLEX was one of the major sponsors of the inaugural WINTER DRESSAGE FESTIVAL held by Dressage NSW at Clarendon. Two hundred and forty horses competed at this Festival which ran over three days between 11, 12 and 13th July. Riders of all levels came from far and wide, one combination from as far away as Cairns! The Festival embraced first timers as well as seasoned professionals. All levels of tests were held as well as Freestyles to Music. It was a great success and will be held again next year when, say officials, it will be bigger and even better. TECHNYFLEX sponsored a variety of classes ranging from the 3:3; 3:3 (Ponies); Inter B; 1:3 and 1:2 Divisions 2 and the Advanced Freestyle. (top right picture) Jayna Prell and Kilfeera Shaman winners of the amateur/owner division and second overall in Division 2 of the TECHNYFLEX Preliminary 1:2.